Photograph of last set of second day of the 13th Vision Festival. After five nights of scorched-earth improvising, poetry, dance and live painting, Vision Fest wrapped up its 19th annual incarnation on June 15. 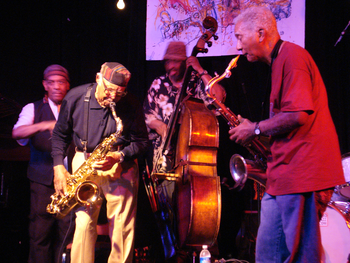 It continues to be New York’s most renowned avant-garde jazz happening — partly because it upholds tough convictions about the links between art and politics, music and other media, self-expression and self-determination. It is entirely artist-run. Sometimes a recording sits on your shelf or your phone for a while. You listen to it sporadically, and it grows on you until you realize that it is quite an excellent offering. Never mind that it took you several months or years to figure that out. 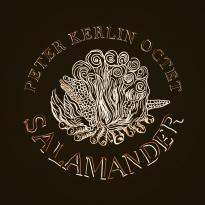 Brooklyn bassist Peter Kerlin’s Salamander falls squarely into this camp. Kerlin leads his Octet (which features Amy Cimini, Jessica Pavone, and Mike Pride among others) on a romp through chamber jazz and minimalist classicism with a solid groove. Most tracks feature interlocking patterns of Kerlin’s signature bass lines with strings and vibes. This approach is repetitive, but richly layered and anything but dull. The heavy use of organ provides a retro-seventies feel, but some of the more improvisational pieces are just noisy enough to break out of that decade’s cliched sound. This is unique recording, and needless to say, a grower. In retrospect, Salamander probably should have been on my “best of 2013” list, and definitely has flown under the radar of many reviewers. Kerlin’s music has a wonderful, understated voice. Highly recommended. 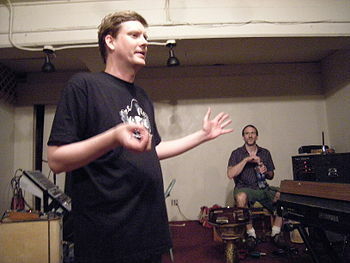 Jim McAdams introduce an act at the 14 th Olympia Experimental Music Festival, Olympia, Washington. After 20 years of working with and playing at the Olympia Experimental Music Festival, organizer Jim McAdams still can’t define experimental music — and he’s not trying to. What the festival has been doing for the past two decades is helping to redefine music. Rudresh Mahanthappa may be the least traditional traditionalist in jazz. 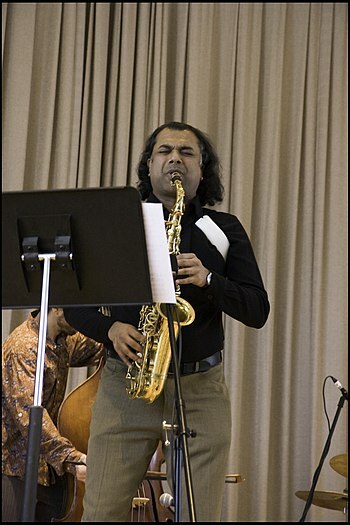 Along with pianist Vijay Iyer and guitarist Rez Abbasi, the alto saxophonist is perhaps best-known for his efforts to incorporate elements of Indian classical improvisation into jazz. But he has also made it clear, through recordings with musicians as diverse as drummer Jack DeJohnette and saxophonist Bunky Green, that he’s equally at home with the standard jazz vernacular.